Tesco and French supermarket retailer Carrefour today announced plans to form a global long-term purchasing alliance, as they seek to cut costs. The deal is the latest partnership within the European retail industry, which has seen US internet giant Amazon make in-roads into the sector in recent months. The alliance will cover the strategic relations with global suppliers in areas such as marketing services or data collection as well as the joint purchasing of own-brand products and goods not for re-sale, Carrefour said. The deal, which will be formally agreed in the next two months, will exclude fresh food products, while each company will continue to work with supplier partners at a local and national level. 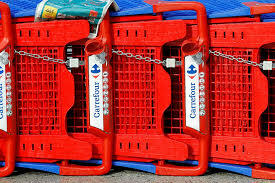 “This strategic alliance between Carrefour and Tesco is a major agreement as it combines the purchasing expertise of two world leaders, complementary in their geographies, with common strategies,” Carrefour CEO Alexandre Bompard said. Tesco, Britain’s biggest supermarket with sales of £51 billion, has been rebuilt by chief executive Dave Lewis after a 2014 accounting scandal compounded a sharp downturn in trading. As part of that recovery the group, which has operations in eastern Europe and Malaysia and Thailand, has improved its relations with suppliers while raising pressure on its domestic rivals with price cuts. Carrefour, Europe’s biggest retailer, makes the bulk of its €88 billion worth of sales in Europe, while Brazil is its second-largest market after France. The deal with Tesco excludes China and Poland. In January, Carrefour announced plans to cut costs and jobs, boost e-commerce investment and seek a partnership in China, in an effort to lift profit and revenue and beat domestic rivals in the race to develop digital shopping products. Carrefour also announced earlier this year a five-year purchasing alliance with French supermarket firm Systeme-U to make Carrefour the biggest buyer in its competitive home market.